ExcelSafe provides user-level security to Excel spreadsheets. Each user group can be assigned particular privileges, like the right to create new spreadsheets, edit existing spreadsheets, or add an electronic signature. Administrators can define password complexity. System administrators can re-set user passwords. 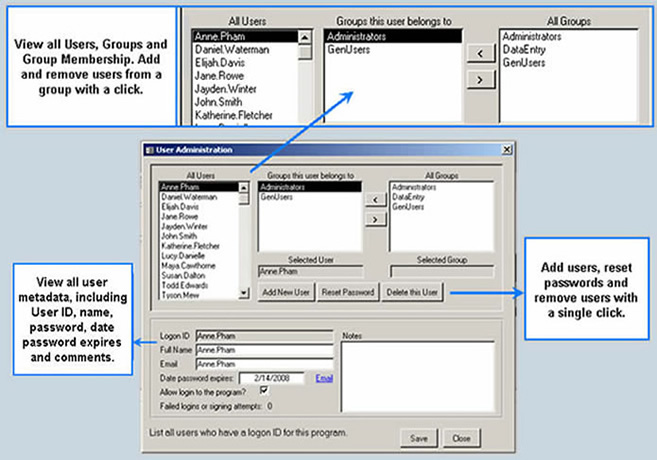 Administrators can select users, edit the groups the user belongs to, and view all user metadata. Users can be added to or removed from a security group with a single click. Administrators can also create new users, reset passwords, or remove users from the system.